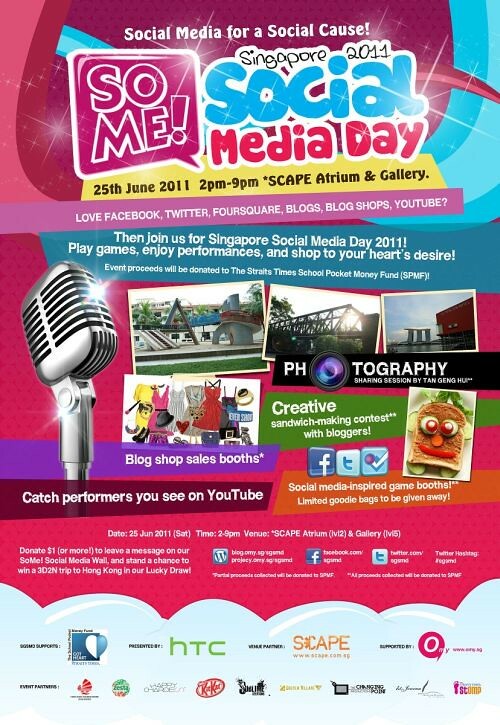 Drop by *Scape this Saturday (25th June) for a good cause. Singapore's first Social Media Day (SGSMD, see Facebook, and Twitter, hashtag #sgsmd) 2011 promises to be a day of fun-filled activities organised by social media volunteers and enthusiasts. Donate $1 or above to charity and you could win a 3D2N trip to Hong Kong, courtesy of the Hong Kong Tourism Board. As you know, you can never go to Hong Kong enough times. The event's tag "SoMe" (contraction of "Social Media") does encapsulate how social media is about expressing oneself. But we can see that social media can be used for sharing with the less fortunate as well as socialising. * SoMe! Superstars: Youtube performers, in the flesh! * SoMe! Games: Have fun at the game booths located at Level 5 Gallery, earn game ‘stamps’, and collect stamps at all 4 game stations to redeem your exclusive SoMe goodie bags! * Creative Sandwich-making contest**, Stage Games, and more! This event is presented by HTC and supported by omy.sg. Thanks to Alvin for the info and content. See his post for even more details.